Solar eclipse brings back the memories of my childhood. I do not remember much though… it must have been in the late 80’s that it was visible and was to be total Solar eclipse. That was the time I got introduced and also a ttracted to this celestial event which takes place due to the specific positions of the Sun and the Moon. It was always a story for these kind of celestial events told by the grandparents and we believed them often than not. In the earlier days people used to donate many a things after the eclipse in India. Especially, because the occurrence of eclipse meant that a mythological demon called Rahu would d evour the Sun god and hence the star disappeared for some time. Why did the demon let go the sun god after some time is however not known!! Though we were put up in Mumbai, after every small or big Solar or Lunar eclipse , beggars would come out asking for alms and people would donate voluntarily. There was no question of not believing the mythology! It was only during that first time that dad explained us the actual phenomenon with dra wings and it took me by surprise. I desperately wanted to see it… but it was not be visible from Mumbai. Even then there were solar protective sun glasses being sold in the markets and I had insisted we buy it. May be it was a Sunday, or I had missed my school, my sister and I were at home. The television had for the first time in my memory had a whole day programme, with flashes of the eclipse taking place. It is now known that a Solar eclipse occurs when the moon passes between Earth and Sun. If the moon's shadow happens to fall upon Earth's surface at that time, then we see some portion of the Sun's disk covered or 'eclipsed' by the Moon. The partial and the total eclipses depend on the distance between the earth and moon. 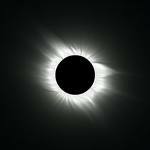 The next Total Solar eclipse to be visible from India was about 15 years ago in 1995 and many places in India were to witness that. This time I had to see it and luckily enough, it was to be visible nearby from Delhi. We hunted for the Solar glasses in Delhi but they were not to be found. Delhi seemed to be most apathetic towards the event. At the same time there was exposure boom about the event and its accessories in Mumbai and Kolkata. We hit the road late in the night to watch the event which was supposed to take place early in the morning. It was the time just after the festival of Diwali, hence the weather was pleasantly ch illy. We head straight on to Fatehpur Sikri, near to Agra, as that was the place we decided to view it from. The wait was annoying… but when the event took place… it was the most beautiful site that I could think of! The time has come once more and I still long to witness that once in a lifetime event. This time too it shall be viewed early in the morning. The nearest place to Delhi for this is Bhopal and the other is Varanasi. However this time the time – span is 3 minutes and due to the rainy season, people are doubtful of its viewing. But many cities in India shall be able to witness this celestial event on 22 July 2009. Baroda, Indore, Gaya, and then going into north east India with Dibrugarh and then in to China, it will be viewed in huge number. China will have the maximum siting time of about 5 minutes and the time will be perfect, during noon. It should be a great site watching it from the Ganges, and you may also see the hindu rituals that take place after the eclipse is over. Do not miss this if possible. For the accessories you are sure to found in any of the planetariums in your city. The importance is that this shall be probably the last Total Solar eclipse that you can view and that too falling in the International year of Astronomy and 400th anniversary year of the telescope founded by Galileo.